Partisan politics inside the Beltway has been around forever. That’s a given. Unfortunately, these days it has reached such ridiculous heights. That being said, if the Republicans had been serious at all about pressuring Atty. Gen. Eric Holder Jr. to resign, they would have been a little smarter and tried to get some Democrats on board. Instead, it ends up looking like another Republican opportunity to bash the Obama administration and its Justice Department. 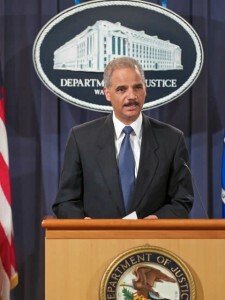 So far, more than 60 members of Congress, along with two presidential hopefuls, have called for Holder to resign. Not one is a Democrat. Don’t get me wrong. I’m not saying the Republicans’ campaign is even legitimate. Sure, Eric Holder should take some blame for the disastrous Operation Fast and Furious, but I don’t think there’s any evidence so far that he intentionally misled Congress as some are saying. Simply put: Having no Dems on their side hurts the cause. In the end, the attack-Holder campaign by the Republicans ends up being just another ugly exercise in partisan politics. Posted: 12/22/11 at 9:27 AM under Uncategorized. I know from a vast amount of experience that Fast & Furious, having been an operation sanctioned under the Organized Crime Drug Enforcement Task Force (OCDETF), a major DOJ program, had to have gone through extensive review by DOJ officials. All of the member agencies of OCDETF had to have signed off on it’s approval and that means FBI, DEA, USMS, ATF, ICE, and IRS/CID representatives had to been presented with a very detailed operational proposal from the ATF special agent in Phoenix. No OCDETF operation can be approved and funded without being extensively reviewed by OCDETF career and politically appointed lawyers at Main Justice. In addition, no civil servant could approve NOT telling the Mexican government. This would have to be made at a very high level of government. Because it was international in scope, the U.S. Department of State would have to give prior approval. Why isn’t Hillary screaming bloody murder that they screwed up our relationship with Mexico? I find that and several other things highly suspicious. Holder might not have known, but he certainly should have, so heads should already have rolled.